Jermaine O’Neal is easy to undervalue because of how much he got passed around the league later in his career, but his 8 seasons with the Pacers were very impressive. He averaged a double double in points and rebounds from 2001 to 2004 and 20+ points from 2002 to 2006. Also a great defender. 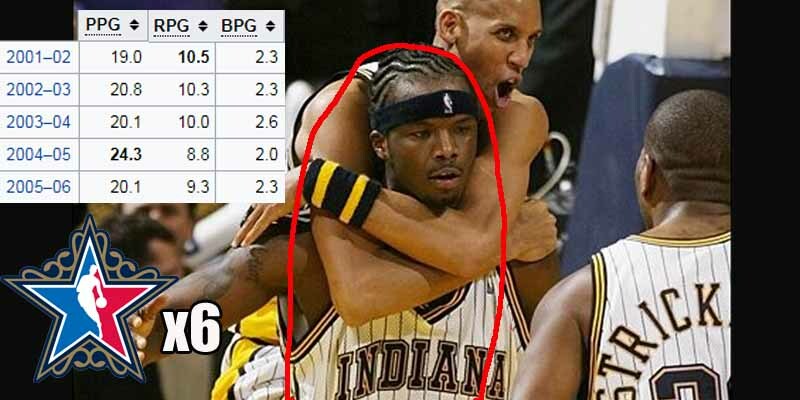 This kind of output helped him help the Pacers to their best ever regular season with 61 wins in 2003-2004 and a trip to the Eastern Conference Finals against the eventual champs Detroit Pistons. All of his 6 All-Star appearances from 2002 to 2007 came with the Pacers.